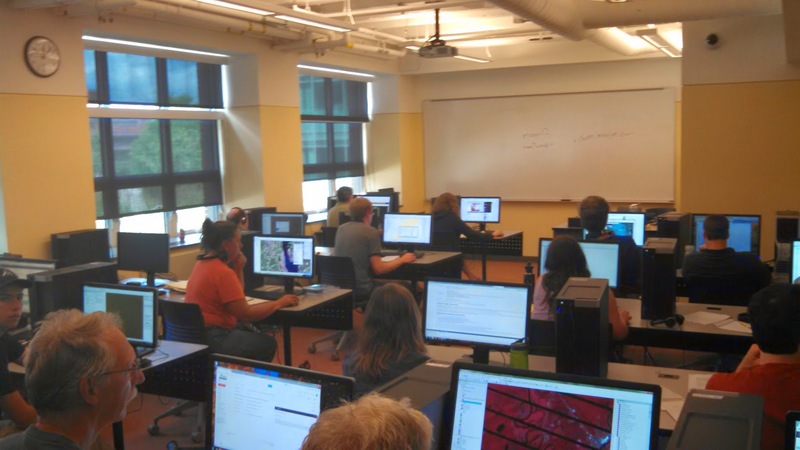 This past week VermontView held its first remote sensing workshop. Over 20 participants from around the state attended. They came from federal, state, and local government, higher education, non-profit groups, and the commercial sector. The workshop was particularly valuable for government employees, who having been subjected to rather substantial budget restrictions over the last several years, have seen their ability to attend professional events severely curtailed. The first day of the workshop centered on imagery. Participants were give a variety of exercises taht focused on building effective remote sensing workflows for processing and analyzing imagery, with a particular focus on Landsat, the Vermont orthophotos, and NAIP. All of those attending the workshop use imagery such as the Vermont orthophotos and NAIP on a daily basis, but understanding the power of multi-temporal Landsat imagery was new to them. Some of the regional planners in attendance remarked at how useful Landsat would be for illustrating change in the communities they serve. The second day of the workshop focused on LiDAR. Thanks to USGS funding the amount of LiDAR coverage in the state is on the rise, but due to the complexity of the data it remains underutilized. Participants had a chance to dig into LiDAR point clouds, generate various LiDAR surface models, and perform advanced analysis using Quick Terrain Modeler. We wrapped up the session by integrating imagery and LiDAR to automatically extract features using eCognition. Despite being new to object-based image analysis (OBIA) a number of participants were able to produce high-quality land cover maps from the data. VermontView is grateful to the many AmericaView partners who offered their insight into running a successful workshop. Given the overwhelmingly positive feedback we hope to make this an annual event. Unlike most other file sharing apps, Portal does not require a PC side ... Zapya.